Hand-battered fish fillets, drizzled with delicious garlic herb sauce, complemented with chips and a side salad. A trio of seafood splendor! 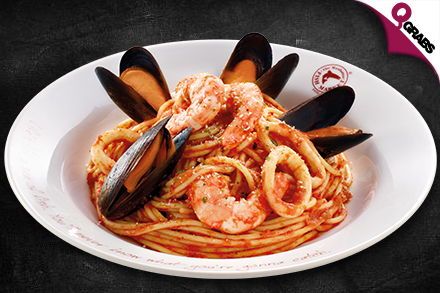 Succulent shrimps, juicy mussels and calamari tossed in marinara sauce. Succulent shrimps, juicy mussels and calamari cooked with fiery chilli flakes. It’s a pasta with a kick. Shrimps sautéed with garlic and chilli flakes for a fiery hit of flavour. Savour a baked cherry snapper or dory fillet in an extra-spicy marinade, complemented with garlic herb rice and hot veggies. Clear the docks and make room for a satisfying flame-grilled cheesy dory fillet on a bed of coriander and rosemary herb rice. For the fish lover who loves their fish whole, this fish is fried to perfection and served with garlic herb rice and hot veggies, topped with your choice of fiery hot or garlic herb sauce. All options come with a Bottomless Soft Drink. 51% off fish & chips worth forking out for! 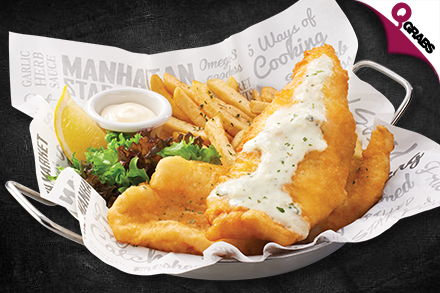 At The Manhattan FISH MARKET, our guests are served with lip-smacking American-style seafood such as the famous Manhattan Fish n’ Chips, the all-time favourite Garlic Herb Mussels and the legendary Manhattan Flaming Seafood Platter. We have come a long way with more than 67 restaurants in Asia and the Middle East, including Japan, Singapore, Malaysia, Indonesia, Thailand, Sri Lanka, Myanmar, Oman, India, Bangladesh and Qatar. We attribute our success and regional popularity to our fresh, flavourful and innovative offerings. To meet our fans’ insatiable appetite for delicious seafood, we are constantly expanding and evolving with brand new restaurant interiors inspired by the famous Fulton Fish Market. Every restaurant is tastefully appointed to evoke the colourful and dynamic spirit of the iconic market! Our well-trained staff are affectionately known as Sea-cret Agents and they channel their passion, energy and dedication into ensuring that every guest will have a satisfying dining experience. The Manhattan FISH MARKET is also widely known to enthrall and whet its guests’ appetite with on-the-spot flaming of the Manhattan Flaming Prawns. In recent years, The Manhattan FISH MARKET brand has garnered numerous awards and accolades in the F&B industry.